It is striking that a classic racing track like Zandvoort and a GP history lasting well into the eighties haven't done enough for Holland to have it produce an F1 star of any significance. This is from a country with more inhabitants - and a bigger Gross National Product - than Belgium and Finland put together, and yet Belgium came up with Jacky Ickx and Thierry Boutsen, while Finland managed to deliver two World Champions - even without a permanent race track to boast with! The trouble is that unlike Belgium and Finland, the Dutch racing scene has never had a tradition to build on and throughout the decades has lacked the support of its wealthy multinational companies. So, in fifty years of post-war GP racing the Netherlands have produced a mere eleven GP drivers, most of them occasional also-rans at the back of the grid. Two of them - Gijs van Lennep and Jan Lammers - did win Le Mans however, while the first sprung a surprise or two with some fine points finishes in deplorable cars, as did count Carel Godin de Beaufort in the late fifties and early sixties. Beaufort was a true gentleman privateer fielding outdated Porsches with his Ecurie Maarsbergen but scoring points on various occasions all the same before getting killed in one of Stuttgart's cars. The only Dutch driver to have put together a reasonable string of GP appearances is also the last in the meagre line of Dutch drivers: Jos Verstappen. Maybe unjustifiably so Verstappen is more remembered for his off-road experiences and for being engulfed in flames at the 1994 German GP than for his quick rise to fame before becoming a GP driver or indeed the flashes of brilliance shown during his early-season Grands Prix at Simtek and Arrows in '95, '96, '00 and '01, almost all of them involving a rain-swept track. 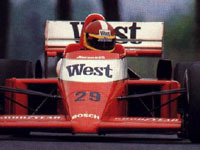 The man instrumental for Verstappen's meteoric elevation into F1 is in this picture, driving the No.29 Zakspeed. Huub Rothengatter's miserable spells at no-hopers Spirit, Osella and Zakspeed would have been long forgotten if he didn't start a second career as manager to the best Dutch driver in history. At first, he seemed born for the job. His adversity in life - Huub had a huge career-destroying crash before he stepped up to F1 - made him into a hard bargain, and his lack of natural talent turned him into an extremely persevering character, who would not give up until corporate Holland came up with the funds to support him. As Verstappen's manager Rothengatter had F1 team bosses notice young Jos after only his 52nd car race, McLaren, Arrows and Benetton all vying for his services. Why? Rothengatter's answer back then was plain and simple: "He has fast lap times." Indeed, a enormously successful first Arrows test had everyone watching his pupil. Suddenly Verstappen was F1's hottest property. In the end, much to the dismay of Ron Dennis, a lucrative testing contract with Benetton was signed. Everything looked prosperous for the former karting phenomenon gazing ahead to only his fourth year in motorsport. But it all went oh so horribly wrong. And to the Dutch it was all Rothengatter's fault. Firstly, Jos should have taken the McLaren test seat, they say. A quiet, professional year getting the recalcitrant MP4/10B up to speed would perhaps have netted him a race seat next to Häkkinen in 1995. Secondly, Jos should never had his Simtek success rise to his head and have Rothengatter dish out remarkable requests for leviathanesque retainers to the big teams, they say. Being the 'man of the moment' doesn't guarantee a shiny future in a situation all the major teams have long-term deals with their drivers. Thirdly, in 1998 they should never stuck out for a Jordan deal to the last minute, thus ending up with no deal at all to show for back home, they say. Still, it's all Dutch courage. The fact is that compared to the F1 fortunes of many other mercurial F3 champs, Jos has really been lucky. He has been on the podium twice and has almost completed a century of GPs. That's considerably more than Jan Magnussen can vouch for. And in terms of net World Championship results Jarno Trulli has only narrowsly eclipsed Jos' record - although he did beat Verstappen fair and square in the "How-to-get-into-F1-quickest" contest, with just 26 car races to his credit since leaving karts and joining F1, a performance that has only recently been beaten by Kimi Räikkönen. On the other hand, you can always wonder how Verstappen's spirited driving style would have grown futher had JJ Lehto not hurt his neck in testing for the 1994 season. But these are the things F1 - and life - are made of. To the disgrace of the Dutch, Verstappen's F1 years haven't really created an atmosphere for Dutch drivers to thrive in. The next in line to follow Verstappen's footsteps, Tom Coronel, failed at the last hurdle, while youngsters like Christijan Albers, Jacky and Ricardo van der Ende and Hugo van der Ham have been scuppered in their attempts to reach F1. Having said that, while Verstappen's once-famed predecessor at Stewart has now been safely tucked away in the ALMS Panoz squad - a GT contract being a certain death certificate for any ex-F1 driver - Jos found a new lease of life in the shortlived Honda factory squad, humiliating the efforts of BAR, Benetton and Stewart during testing at Jerez.